Photo of the Week: Undergraduates, Ahoy! 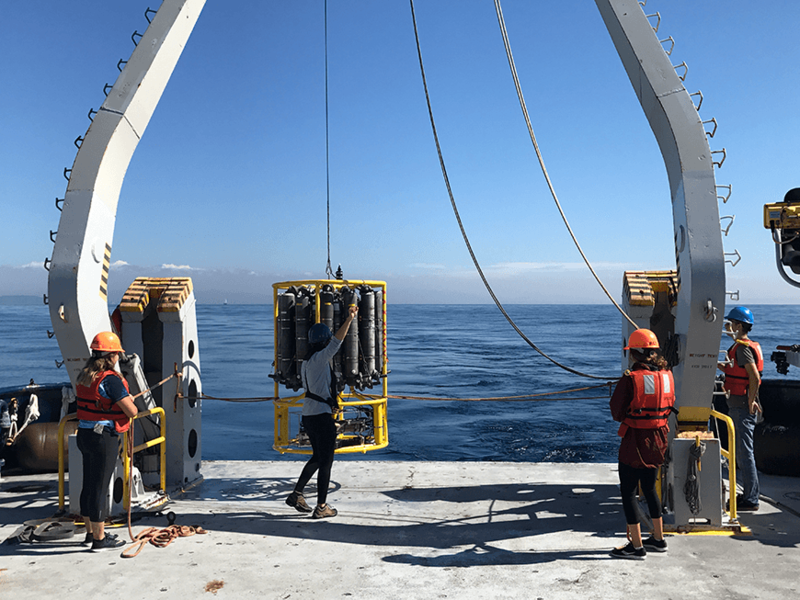 Taught by assistant professors Drew Lucas and Jennifer Vanos, the course covers basic concepts in oceanic and atmospheric dynamics with instruction and hands-on activities. The course is part of the new oceanic and atmospheric sciences undergraduate major, one of four undergraduate majors administered through Scripps. The major engages students in a wide range of topics of scientific interest and increasing social concern including ocean waves, tides, and circulation, natural climate variability including El Niño, human-caused climate change, global warming, ocean acidification, atmospheric storms, and more. The Nov. 4 cruise out of Scripps’s Nimitz Marine Facility was funded by the UC Ship Funds Program, which provides significant support to enable graduate and undergraduate students, postdoctoral researchers and early career faculty to pursue independent research and instruction at sea aboard Scripps ships.